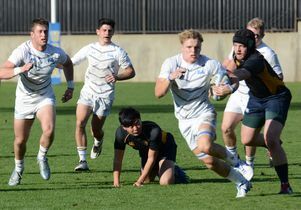 UCLA rugby players competing in a 2019 match at Wallis Annenberg Stadium. 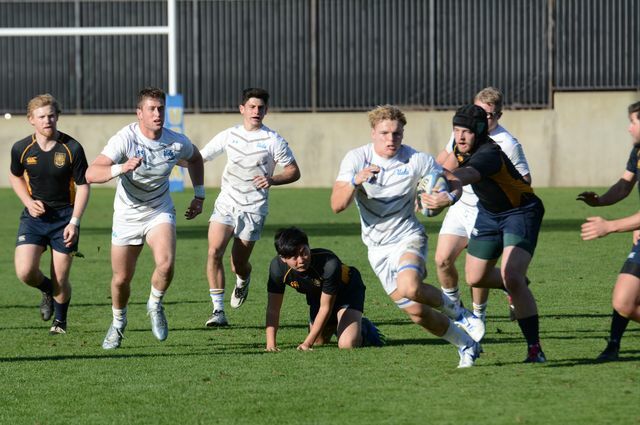 A $2 million gift from Alison Chace Pulley and Christopher Brown will support the UCLA men’s rugby club team as well as continuing renovations to the stadium the team shares with several other UCLA sports programs. The contribution includes a $1.5 million lead gift for the second phase of upgrades to Wallis Annenberg Stadium, home of several UCLA club sports, such as rugby and lacrosse, and the men’s and women’s intercollegiate soccer teams. The first phase of improvements, completed in 2018, included new turf, lighting and a scoreboard, which were made possible by generous gifts from the Annenberg Foundation, Jim and Carol Collins and other donors. The project’s second phase will include the construction of a permanent grandstand and additional space for spectators. The remainder of the gift will expand resources for travel, recruitment and coaching for the UCLA men’s rugby team, which since its founding in 1934 has existed as both a club team and as a varsity team and has produced more than a dozen U.S. national team members. Now operating as a club team, the squad comprises student-athletes from across the U.S. as well as Australia, Japan and the United Kingdom. Led by head coach Scott Stewart, a former Canadian national team player, the team has become a regular participant in the collegiate rugby championships, reaching the finals in 2016 and 2018. Pulley earned a bachelor’s degree in English from UCLA in 1991 and has gone on to establish a career as a TV host, actress and entrepreneur. Brown attended UCLA from 1983 to 1985 before founding Global Emerging Markets, an investment group; he now oversees the firm’s New York office. Their gift honors their experiences at UCLA and enhances an area of campus where they enjoyed spending much of their time as students. The gift is part of the Centennial Campaign for UCLA, which is scheduled to conclude in December 2019 during UCLA’s 100th anniversary year.